Carb load before the big run! Jacksonville’s food scene is an eclectic hybrid of inspired casual elegance and classic southern comfort, infused with the flavors of the coast and a dash of international flair. No other Florida city has more unique flavors than Jacksonville, a melting pot of cultures and tastes, with a thriving culinary culture pioneered by local chefs that have been nationally and internationally trained. Get that runner’s high and avoid hitting the wall by fueling up in some of Jacksonville’s most delicious restaurants during your marathon visit this February. 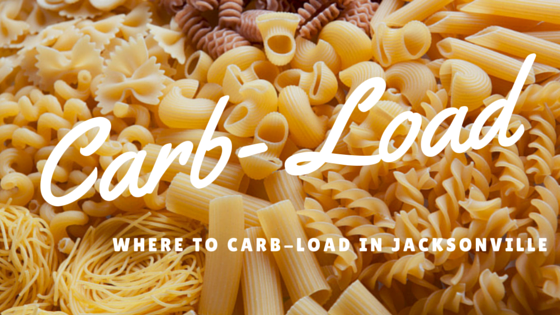 We’ve compiled a list of restaurants that are featuring “carb”tastic dishes for you to nosh on before and after the big run. Seafood Risotto: a beautiful blend of lobster, shrimp, scallops, urchin broth and bottarga, served over delicious risotto. Kearney's Corned Beef Hash: Thumann's crispy gourmet corned beef and hash served with 2 eggs any style. Cinotti's Donut Sandwich: Applewood smoked bacon or Azar sausage patties, fried eggs and cheddar cheese on a Cinotti's glazed donut. Served with baby cakes. Avocado Cobb Salad: Romaine lettuce, avocados, hard boiled eggs, bleu cheese crumbles, applewood smoked bacon, tomatoes & choice of dressing. Irish Lasagna: Lasagna noodles, roasted tomato and Guinness sauce with Irish banger sausages, cabbage and ricotta and mozzarella cheeses. Gummy Fried Eggs: Scrambled or sweet? Sweet gummy eggs are a real treat that keep you going for a long race! Roasted Butternut Squash and Spaghetti: house spaghetti, seasonal mushrooms and fried sage. It comes as an Appetizer for $12 and as an Entree for $18 and you can add duck confit for $5 or add pork belly for $3. M Shack Insanity Burger: two hamburger patties sandwiched between two grilled cheese sandwiches complete with the fixins - lettuce, tomato, pickle, shake sauce. Hot-pressed, gourmet 'Silicon Valley' Panini (turkey, bacon, tomato, pesto, avocado, American and cheddar cheese) with a side of fresh, grilled asparagus! What to eat at the Beaches & Mayport: Seafood of course! Jacksonville’s own Mayport Shrimp is the culinary staple of the region. Enjoy it and other local fresh seafood at unique and delicious spots like North Beach Fish Camp, Marker 32, Mezza, Safe Harbor Seafood Restaurant and the Fish Company Restaurant and Oyster Bar. What to eat at the Southside & Mandarin: Don’t be fooled, despite the ample presence of nationally known restaurant chains, the Southside also managers to have its own unique flavor with options like Metro Diner, Maple Street Biscuit Company and Ovinte, to name a few. For a real Southern Food experience in Jacksonville visit The Potter’s House Soul Food Bistro and Gilbert's Social...you won’t regret it! What to eat in Riverside & Avondale: Welcome to foodies mecca! These historic neighborhoods are putting Jacksonville’s culinary scene on the national map. While visiting be sure to indulge in some of the city’s best restaurants located in the eclectic FivePoints District, on King Street, and in the Shops of Avondale. Don’t miss Hawker's, Carmines Pie House, The Mossfire Grill, and Burrito Gallery.